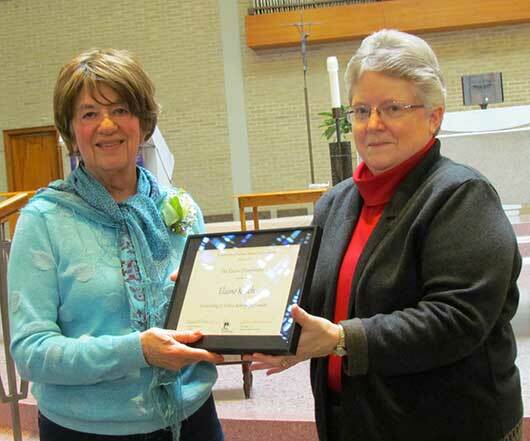 Photo of Elaine Kinch (left) receiving the Woman of the Year award from Racine Dominican president, Sister Maryann McMahon. On Sunday, March 6, public defender Jennifer Bias and justice advocate Elaine Kinch were honored as “Women of the Year” in a special prayer service and presentation at Siena Center, home of the Racine Dominicans. Bias is the director of the Trial Division for the Wisconsin State Public Defender’s Office. Since beginning with the agency in 1987 as an assistant public defender, she has served in a variety of leadership and litigation positions, being promoted to several administrative positions since 2000. From 1995-2000, Bias served as the regional supervisor in Racine County. She has also served on many boards, including the Commission to Reduce Racial Disparity in Wisconsin’s Criminal Justice System (created in 2007) and the resulting Oversight Commission, with responsibilities for advocacy and accountability in reducing racial disparity. Bias has presented at the annual public defender conference on various topics. She currently presents the “Best Defense Is No Defense” program to young people at schools, churches and community centers, urging them to avoid violence, gangs and drugs. Kinch was a founding member of the Racine Coalition for Peace and Justice, established in 2002. Last year she was elected co-chair of the coalition. She helped to bring noted speakers to Racine, including Rabbi Brant Rosen, co-founder of the Rabbinical Council of the National Jewish Voice for Peace. Her public service, spanning over three decades, has been that of organizing citizens to bring awareness of injustice to the people of Racine. In the 1980s, Kinch was the organizer for the Central America Solidarity Coalition of Racine. She participated in five human rights delegations to Central America, sharing what she learned, organizing a human rights rapid-response network and educational presentations by Central Americans to various groups in Racine. Her concerns about the situation in El Salvador led her to take in two Salvadoran refugees. After studying the history and impact of the Palestine-Israel conflict and the Israeli occupation, Kinch participated in an olive harvest and a liberation theology conference in Palestine. She gives presentations on Palestine.